Discussion in 'Amateur Radio News' started by NW7US, Jan 3, 2018. Are you interested in starting out with the amateur-radio digital modes on the high frequencies? Have you heard of FLDigi? FLDigi is a software control and modem suite that interfaces with your transceiver, your computer sound card, and other input/output interfaces so that you can receive and transmit one of many digital modes. For example, FLDigi allows you to operate using the Olivia digital mode. While making quick work of getting DX stations into your logbook by exchanging callsigns, a signal report, and a grid square, the JT/FT modes (JT stands for Joe Taylor, the fellow that pioneered these modes) are limited. They cannot handle any additional communications beyond a callsign, a signal report, a grid square, and a very limited set of acknowledgments and sign-off messages. When you desire to get to know people from other areas of the world, or if you need to establish networks around the world for passing information--perhaps an emergency net in support of the Red Cross--or if you are motivated by any other of a myriad reasons to establish a keyboard-to-keyboard conversation by way of the ionosphere, modes like Olivia are great candidates for your consideration. 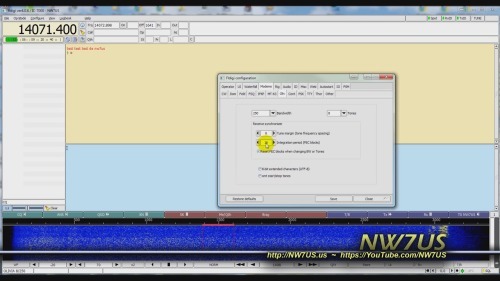 In this video, contributing editor with CQ Amateur Radio Magazine, NW7US shares some starting points in the FLDigi software for Olivia keyboard-to-keyboard chat mode. 1.8269, 3.5729, 7.0729, 10.1429, 14.0729, 18.1029, 21.0729, 24.9229, 28.1229, and so on. See the pattern? By the way: The current suggested CENTER frequency With 16/1000 or 32/1000 on 20 meters is 14.1059. Q: What's a 'CENTER' Frequency? Is That Where I Set My Radio's Dial? For those new to waterfalls: the CENTER frequency is the CENTER of the cursor shown by common software. The cursor is what you use to set the transceiver’s frequency on the waterfall. If your software’s waterfall shows the frequency, then you simply place the cursor so that its center is right on the center frequency listed, above. If your software is set to show OFFSET, then you might, for example, set your radio’s dial frequency to 14.0714, and place the center of your waterfall cursor to 1500 (1500 Hz). That would translate to the 14.0729 CENTER frequency. N6ITE, KE8EC, N9PBD and 2 others like this. Great write up Thomas, and thanks for all our work getting the word out. Now that the holidays are behind us I can get back to getting our new net up and running. We all know that the working conditions on 75/80 meters are rough at best, but again will be attempting to run a net this Friday the 5th of December. Hope it see and hear everyone that may check in. KE8EC, N9PBD and W6ERM like this. It doesn't seem to recognize my Windows 10 tablet, built in on screen keyboard. I tap on the places where you are supposed to type things (text fields) when using the program, and no keyboard automatically pops up on my screen like it normally does in other programs. It only works if I connect an external USB keyboard to my tablet. Is there a help forum link or anything, or is it a bug ? Looks like a great program and it does quite a few things including logging and nice options for uploading logs to LoTW. The installation was easy and pretty straight forward. The user interface is great. Very clean and not excessively busy like other programs I used in the past. Everything is well laid out in a very logical and easy to understand format. I am going to use it for outdoor qrp stuff and that's why I would like to use it with a small, lightweight Windows 10 tablet instead of a laptop. I have a Bluetooth cat interface on my ft-817 too for frequency control and PTT, but i'm still using a wired sound card interface at least for now. Would be nice to see more wireless Bluetooth support in the future too. In any event, good job on this great program. Maybe someone has some ideas or pointers. I use FLdigi myself. It's a great piece of software that runs circles around MixW. Olivia is a great ragchew digital mode. I see allot of activity on 20, 40 and 80 meters. Another mode that is similar to Olivia that I like is MFSK16. I see it's use only on 20 meters anymore. So is the next net tonight? 0200Z on Friday (the time and date listed with BIG letters on the image above) is 9PM EST on Thursday here in the US. Thanks for the info gents used it a few times nice rag chew digital mode. Here in the USA, the net will start tomorrow evening (Friday the 5th) at 0200 Zulu. Will just call it Friday the 5th at 7: pm mst.